The Boston Celtics are through to the Eastern Conference Finals where they will meet bitter rivals the Miami Heat beginning with Game 1 Monday night at the American Airlines Arena in Miami. And while the Heat got there quicker, disposing the gutsy Indiana Pacers in six games after briefly trailing their series 2-1, the Celtics navigated the full route to eliminate the No.8 seeded Philadelphia 76ers. Rajon Rondo tallied the ninth triple-double of his young career -- 18 points, 10 rebounds and 10 assists -- to lead Boston to a thrilling 85-75 Game 7 victory Saturday night at the TD Garden in Boston. As in previous games throughout this series, the No.4 seeded Celtics again struggled in Game 7. They couldn't score in bunches. They turned the ball over 14 times and they did not dominate the boards, a staple that allows them to manufacture easy fastbreak points. All those woes got exponentially worse when Boston lost their go-to-guy, Paul Pierce, to six fouls in the final 4:16 of the fourth quarter. That's when Rondo carried Boston on his back. With Pierce gone and his team holding on to a slim 71-68 lead, Rondo went on a mini rampage. He hit a lay-up, swished a 23-foot-jumper, before nailing a 3 from 27 feet deep to cap a 7-0 run. And just like that, almost in the blink of an eye, the Celtics moved up to 78-68 with just 2:09 left to play. The never-say-die Sixers tried to mount one more rally when Jodie Meeks sank a 3 to come to within 80-72 with 57 ticks to go, but Rondo put a lid on that uprising with four endgame three throws that sealed the outcome. Pierce fouled out with 15 points while Kevin Garnett had 18 points and 13 rebounds for the Celtics, who shot just 42.5 percent from the field (31 of 73 field goals) and 17.6 percent from 3-point range (3-of-17). The Sixers outrebounded the Celtics 45-44, but they didn't do themselves any favor on the offensive end by making just 28 of 80 field goals for a poor 35 percent clip. 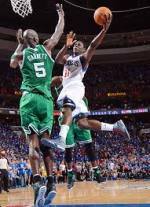 Philadelphia drained 14 of 20 free throws but it went only 5 for 18 from above the 3-point arc.